The USS RICHMOND was a 2604 ton wooden steam sloop of the Union Navy during the Civil War. On March 14, 1863, she was in one of the fiercest naval engagements of the war when she was in a column of Union ships attempting to pass the Confederate fortifications at Port Hudson on the Mississippi River about 15 miles upriver from Baton Rouge. As RICHMOND passed Port Hudson the ship was bombarded by shore batteries. When almost past the batteries a 6-inch shot penetrated the ship’s wooden side and struck the starboard safety-valve chamber severing a steam line. The space immediately filled with live steam and placed the ship in an extremely critical condition. Acting courageously in the crisis and realizing the ship might explode, First Class Fireman Joseph E. Vantine took off his woolen shirt, tore it into four parts, and ran up on deck and soaked them with water. He then gave three of them to three other crewmen and each of the four men then covered their faces with the soaked woolen and made their way into the steam filled space. There, in spite of the scalding steam, they laboriously were able to douse the hot fires of the furnaces and saved the ship. The combined effects of fire and steam compelled the four men to relieve one another at intervals as they were overcome by heat until their work was accomplished. For their efforts in saving the ship and heroism, each of the four men was awarded the Model of Honor. Joseph E. Vantine was born on March 29, 1835, in Philadelphia, Pennsylvania. After obtaining an education in the Philadelphia public schools, Vantine spent some time with an uncle on an oyster boat. At the age of sixteen he became a blacksmith apprentice and in 1858, having completed his apprenticeship, he joined the Union Navy and was assigned to the USS RICHMOND. He spent three years aboard the ship in Chinese waters until it was ordered home because the Civil War had begun. Vantine proved to be a valuable crewman and originated the plan of suspending chain cables about the most vulnerable parts of his ship. He was discharged from the Navy at Brooklyn Navy Yard on September 10, 1864, and became an engineer for an iron works company. In 1895 he suffered a paralytic stroke which disabled him from further work. 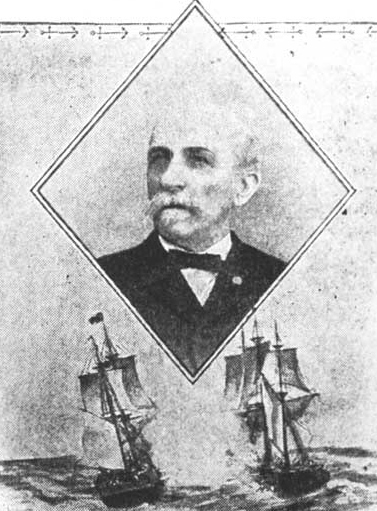 He died on May 5, 1904, and was buried at Glebe Cemetery in New Castle, Delaware, where his grave marker carries the inscription: MEDAL OF HONOR – USS RICHMOND – CIVIL WAR.